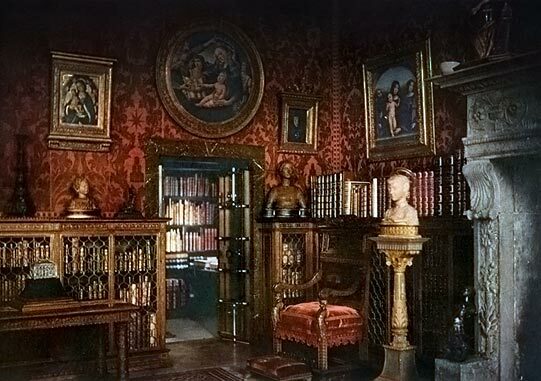 The Study is the most sumptuous and yet personal of the library rooms and the one that best reflects the personal tastes of its original occupant. It was here that Morgan met with art dealers, scholars, business colleagues, and friends. As Herbert Satterlee, Morgan's son-in-law and first biographer, later recalled, "No one could really know Mr. Morgan at all unless he had seen him in the West Room. This was because the room expressed his conception of beauty and color in varied and wonderful forms." One of the most remarkable features of the room is the antique wooden ceiling. 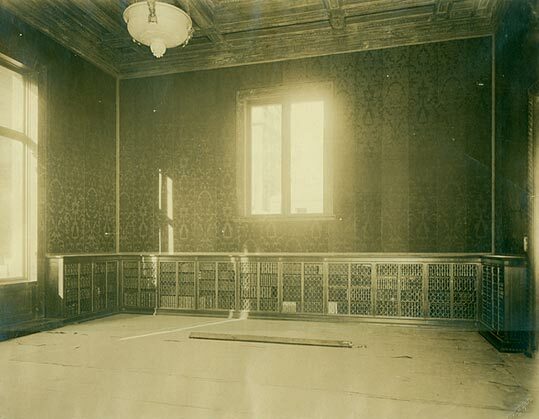 McKim purchased it in Florence and had it reassembled to fit this room. James Wall Finn (1866–1913) was commissioned to antique the ceiling with coats of arms copied from a volume on Renaissance bookplates in Morgan's collection. The precise date and origin of the ceiling are unknown. The stained-glass panels set into the windows date from the fifteenth to the late seventeenth centuries; they are from memorial windows formerly in churches and monasteries in Switzerland. The red damask wall covering bears the Chigi coat of arms, an eight-pointed star and mountain formation. The original silk was imported from Italy, where it had decorated the palace of the great banking family. Time and pollution took their toll: the present covering was replicated by Scalamandré. The mantelpiece has been ascribed to the studio of the Florentine sculptor Desiderio da Settignano (ca. 1430–64) and the bronze fire-dogs are of early sixteenth-century Paduan or Venetian manufacture. The kneeling angels holding candelabra are Florentine, of polychromed wood, and are contemporary with the andirons. The settee, the desk, the desk chair, and the end table were custom made in 1906 by Cowtan & Sons of London, in England in the style of the Renaissance.